While we've previously covered a small bathroom makeover on this blog, today's post expands on it by digging into ways to inject personality into private spaces that are best known for function over form. 1. Find At Least One Feature/Finish to Splurge On: As with any room, you want to have a focal point or feature that draws the eye initially and that is complemented by the rest of the design. 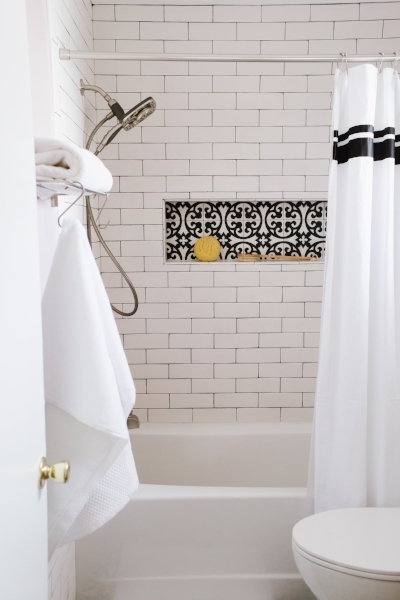 In small bathrooms, one easy way to do this is through floor and accent tile. In both of these bathrooms, we chose conversation-worthy tiles — a black and white cement tile for the hall bathroom (LiLi's Marrakesh 1 from Architectural Ceramics in Chevy Chase) and a blue-toned marble chevron tile from TileDaily for the master bathroom. 2. Make Small Changes That Feel Custom: You may not have the budget for custom cabinetry but consider swapping the hardware or adding a custom countertop to a pre-built unit. In the master bathroom, we swapped out the silver hardware for a square-shaped brushed gold finishes to match the other hardware and paired it with a quartz top (Emerstone Quartz Carrara White from Architectural Stones in Rockville) that matched the in-shower bench added during the renovation. Other ways to add a custom feel without spending too much include using tiles in different shapes (we used 3x9 in the hall bathroom and 3x12 in the master bathroom) or with a contrasting grout (as we did in the hall bath to complement the cement tile floor). 3. Include Contrasting Elements to Add Interest: As in other spaces in the home, don't hesitate to play with tone and texture to add personality. In the hall bathroom, we paired a more modern natural wood vanity with the starker black and white tile work. My client chose to go with brushed silver hardware but another option is to add matte black/iron finishes to tie together the modern vanity and the vintage-feeling tile. Contrast can also come in the form of color, like the Behr Vintage Mauve paint in the aforementioned bathroom or the blue towels in the master bath (bringing out the blue tones in the chevron tile and contrasting with the Behr Sandstorm paint). Many thanks to Beth Caldwell of Beth Caldwell Photography for capturing the "afters" above. I hope these tips will help you as you think about future projects and how to be anything but boring but stick to a budget. Happy remodeling!